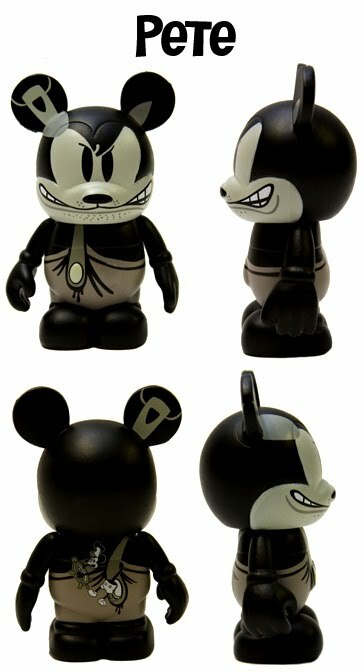 Update: 1/20/11 We now have photographic proof of the price of a single blind box. $9.95 in US ($12.95 in Canada). We also know that the triplet is Pete! Thanks to @keithkrebs! 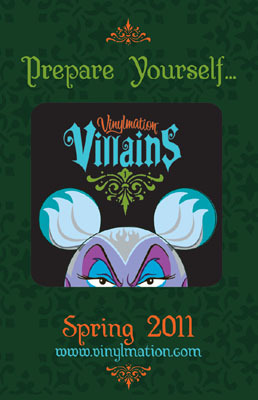 Update: 1/15/11 Disney’s Vinylmation Blog has announced the “official” released date as January 31, 2011. Villians 1 is a Disney Store exclusive and according to the blog will be released at “select” Disney Stores in the US and Canada. 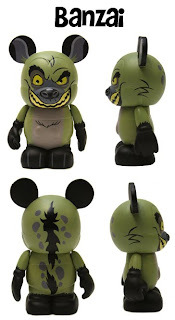 (Although some Disney Stores have them already out). 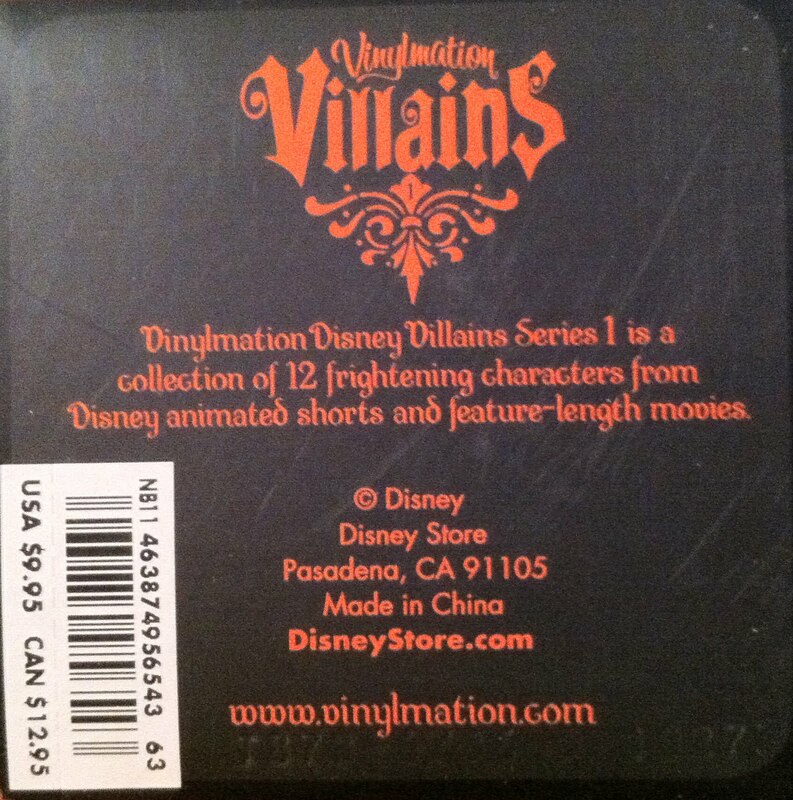 Update: 1/14/11 At the Star Wars release several people said their Disney Stores said they would release Villains on January 28th. So that’s the newest rumor. We’ll find out later today if any stores have them out today. 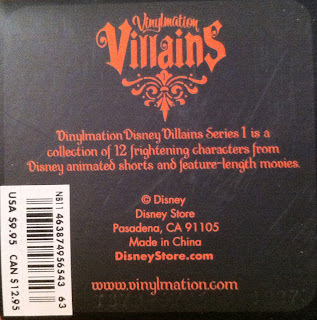 Update: 1/12/11 It’s been rumored that the set might hit Disney Store shelves as early as Friday, January 14th. It’s only two days away, so we’ll see soon. Update: 1/7/11 Click here to see what each blind box and the case will look like. Update: 1/4/11 Check out the teaser image we found at “The Buzz” (one of Disney’s online blogs). It seems to confirm that the Villains Vinylmation will be out in Spring, so that changes when we thought they’d be out from January to March, April, or May. 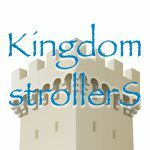 Update: 12/30/10 I thought I’d take today to update our blog posts with new information we received since the original leak back in November. 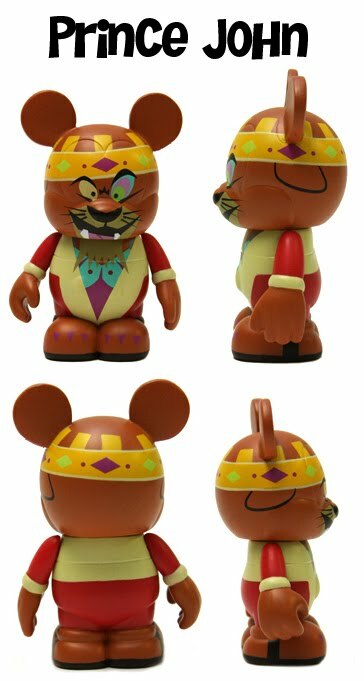 We now have the turn arounds of all the Villains and know the chaser (see below). We also know the artists of each. 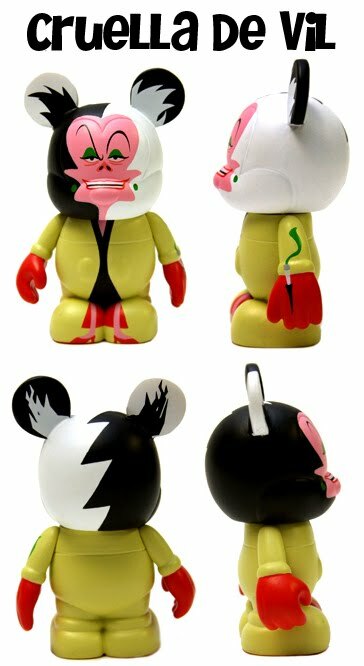 The set will be available in Japan first, and then come to the United States later in January. 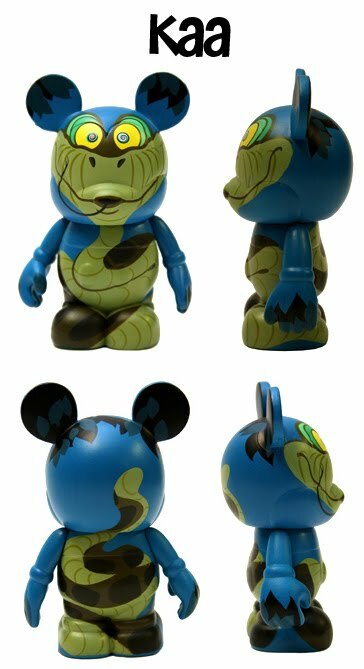 The set will also be released ONLY in Disney Stores. 11/26/10- And there’s more! 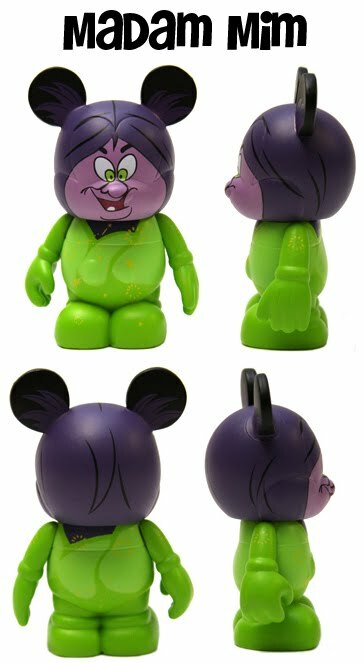 We also found the first figures from the Villains 1 set! (As rumored) Interesting to note that there are no extras or accessories with this set (so far). It’s clearly a spotted Hyena. Shenzi has bangs, Ed has his tongue hanging out, Banzai has the thicker eyebrows that seem to be represented here. He is one of the minions of the evil Scar. Which makes this an interesting choice. 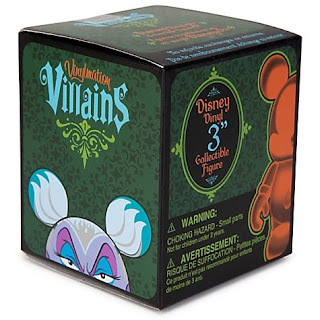 I like how they are including the “side kicks”, leaving us anticipating more with future Villains Vinylmation releases. They did a great job with this one. They captured her evil face perfectly. The body was going to be challenging, Cruella is a very thin character, but she wears this big coats, and they used that to their advantage to fill out the body. Also an interesting choice, as the Bigger Bad from this movie was Shere Khan. With two tigers in the Animal Kingdom set, did they want to avoid another tiger so soon after? She took many forms during the movie as she battled with Merlin. This is a great idea to include the Black Cauldron’s bubbling brew as the body. With the overalls, hat and evil growl, this is one of Disney’s very first Villains. Pete first appeared in a more “bear” like form in the Alice Comedies. 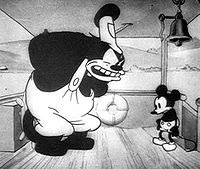 This representation however is clearly from his more well-know Steamboat Willie role. Pete is Disney’s oldest continuing character, predating Mickey, Pete was first archenemy to Oswald the Lucky Rabbit. I LOVE the black and white design! 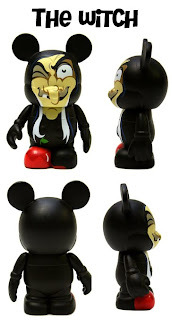 This is Pete’s second Vinylmation appearace. His first was as a chaser from “Have a Laugh” where he was represented in full color as Conductor Pete from “Mr. Mouse Takes a Trip” (1940). I loved Robin Hood when I was a kid, and so I personally enjoyed this Villain and it’s inclusion in this series. Thanks Disney! Great representation here of Ratcliffe’s evil smile! I love the color in this character too. The one thing here… Disney isn’t bashful about adding accessories… where is Ratcliffe’s signature tall hat? This is a perfect representation. 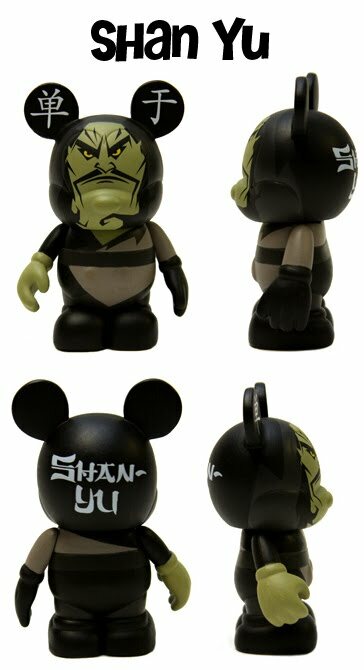 I love the use of Mickey’s nose as Shan Yu’s big, sculpted chin. And I like how they are not afraid to use the whole canvas to add little things. Anyone know what it says in his ears? 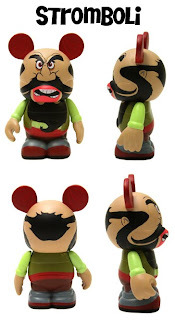 Stromboli is such an over-sized animated character, and they captured that in the head of the Vinylmation. Stretching his face over the entire head and extending the beard down the body really draws your attention. Great use of the ears to represent the curtains on the play stage. In her “Old Hag” form and with an apple that is poisoned for Snow White. They captured her wickedness. I like the way they extended the face down into the body. they could have done many things with the ugly long nose, but I like the idea of drawing it downward instead of just letting Mickey’s nose represent it. The drawn on apple is a great touch, but did they experiment with actually sticking an accessory apple onto her hand? And what’s on the back? Do we get the Queen on the other side? Or is that reserved for a future release? Well, the most obvious choice for the chaser is Maleficent. When ever there is a group of villains, in anything from toys or video games, Maleficent is always there watching over. 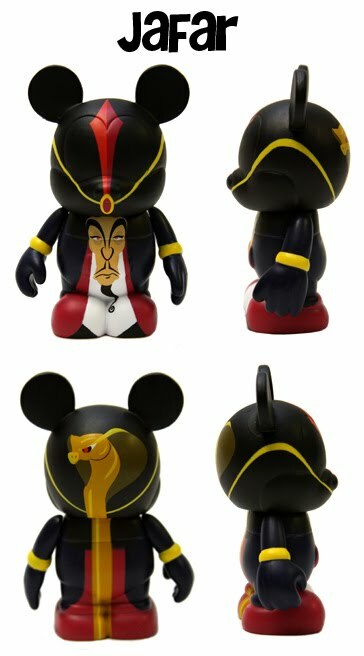 But there are some other groovy choices – Captian Hook, Jafar, or the Queen of Hearts – just to name a few. 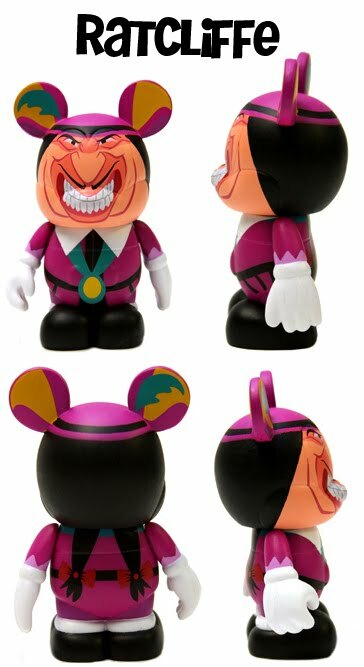 What do you think the final villain in this set will be? 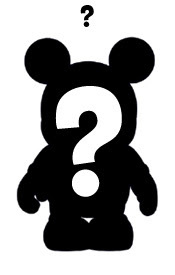 Update: 12/30/10 To avoid spoilers, we hid the image of the chaser (now confirmed). To see who it is and what the Vinylmation looks like just click on the Mystery Chaser image. 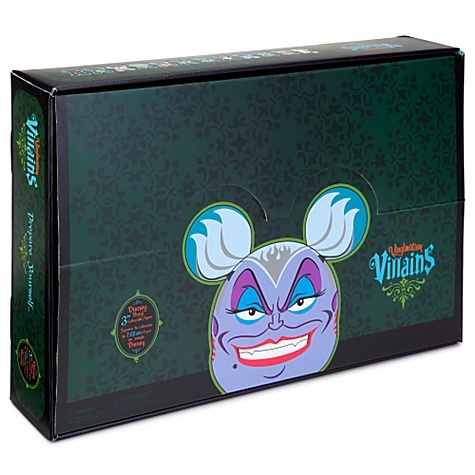 Biggest note is that the character they have chosen to represent the Villains set is Ursula. (Which is great because she is one of the best looking designs). The other note is that there is a number 1 with this series. So that makes us think there will be a Villains 2. W00t!